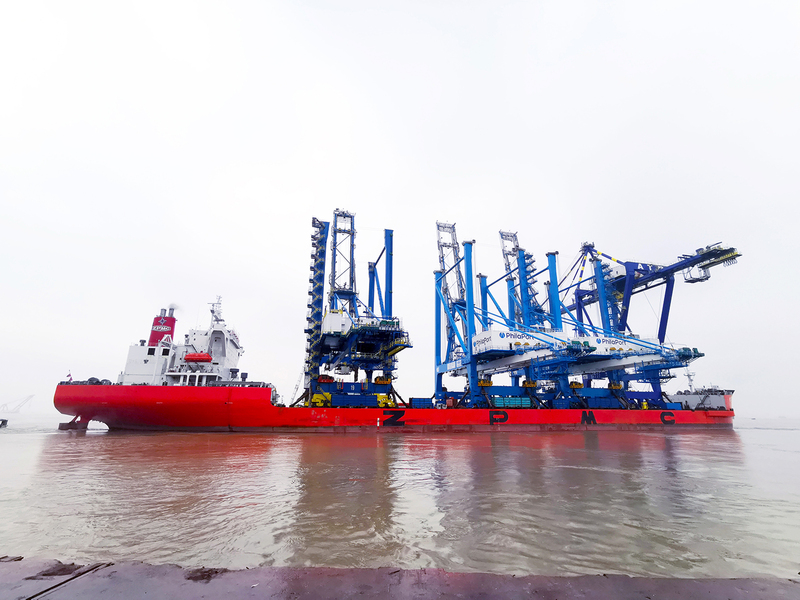 On January 8, 2019, the M/V Zhen Hua 25 departed Shanghai, China with two new super post-Panamax container cranes bound for South Philadelphia. 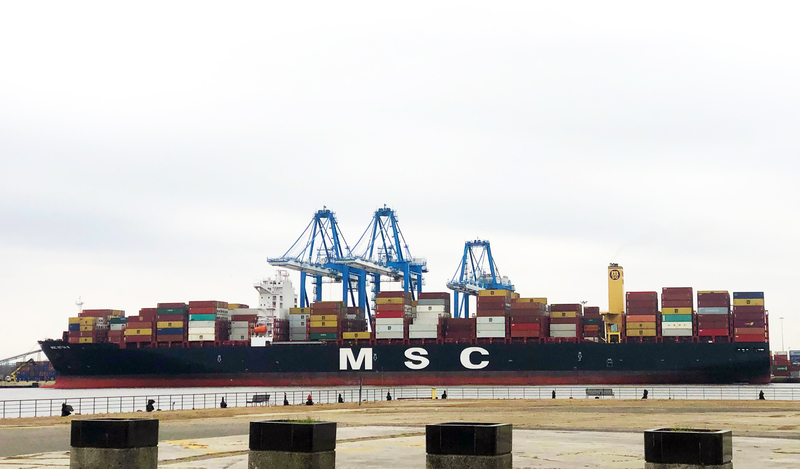 The two behemoths will navigate a lengthy global trek before reaching the Delaware River for an expected mid-March arrival to the Packer Avenue Marine Terminal. The arrival will mark another important milestone in the comprehensive modernization project underway at Packer, and highlights a key competitive advantage for shippers looking to improve time to market on the East Coast of the United States. The M/V Zhen Hua 25 departs the Port of Shanghai on January 8, 2019 with two super post-Panamax container cranes bound for PhilaPort’s Packer Avenue Marine Terminal in South Philadelphia. Boasting a $300 million public-private investment, the Packer Avenue Terminal is quickly becoming a model of 21st century port operations. The forthcoming completion of the Delaware River Deepening Project will provide a full 45-foot shipping channel through Philadelphia, allowing vessels as large as 14,500 TEUs —among the largest in the world— to traverse into the Port. The M/V MSC Nitya B unloading cargo at the Packer Avenue Marine Terminal. 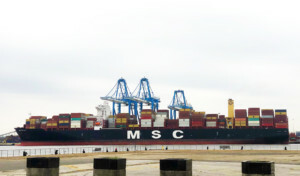 The 12,500 TEU vessel is one of the largest to ever call PhilaPort, a direct result of the nearly completed deepening of the Delaware River Shipping Channel to 45 feet. This deepening project is timed perfectly with the arrival of the new super post-Panamax cranes, which will bring the total operational cranes on the terminal to six (a seventh due to arrive August 2019). This increase in capacity will only lead to improvements on the already stellar 40-minute turn times for containers coming in and out. Terminal-wide improvements in lighting, electrification and warehousing add to a 360-degree modernization that has helped drive overall throughput capacity for PhilaPort to one million TEUs per year. Flexible work hours, abundant access to trucking, multimodal rail and an increasing network of distribution centers in the region all make Philadelphia an ideal destination for a wide variety of import products. And Philadelphia’s location at the heart of the U.S. Northeast Corridor places goods within a days reach of 40 percent of the U.S. population, the most lucrative market in the world. PhilaPort has seen 166 percent container growth in the last decade and has broken all previous records in 2018 by handling 600,000 TEUs. The surge in cargo volume is welcomed and PhilaPort’s Packer Avenue Marine Terminal is ready to take its position as one of the premier cargo gateways in the United States. About About Holt Logistics Corp.
Holt Logistics Corp. is a technology, marketing and corporate service organization, providing logistics management solutions in dynamic segments of the transportation industry. Founded in 1926 as a one truck delivery service, the family-run business has grown to become the dominant cargo handler for the Port of Philadelphia and a major advocate for international business development. Through its affiliates, Holt Logistics operates both the Packer Avenue Marine Terminal in South Philadelphia and the Gloucester Marine Terminal in Gloucester City, NJ, allowing the company to handle both containerized and break-bulk cargo imports from the South Pacific, Europe, Africa, South and Central America. The company regularly hosts international delegations to tout its safe and efficient track record in handling cargo, as well as the superior intermodal transportation options available to products imported through Philadelphia. Now employing its fourth generation spanning 92 years in international transportation logistics, Holt continues to lead continued growth and prosperity at the Port. PhilaPort, The Port of Philadelphia, is an independent agency of the Commonwealth of Pennsylvania charged with the management, maintenance, marketing and promotion of publicly-owned port facilities along the Delaware River in Philadelphia, as well as strategic planning throughout the port district. PhilaPort works with its terminal operators to modernize, expand and improve its facilities, and to market those facilities to prospect port users. Port cargoes and the activities they generate are responsible for thousands of direct and indirect jobs in the Philadelphia area and throughout Pennsylvania.